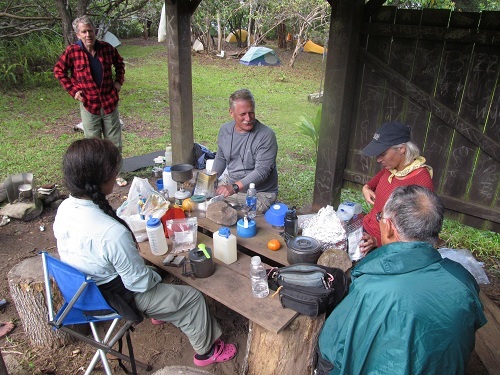 On the second day of the HTMC camp out in the Mokuleʻia Forest Reserve, I looked for rare native plants and animals in Pahole Natural Area Reserve. Our camp site was located at about 2,200 feet elevation. During the night the temperature dropped to 60 degrees and rain fell intermittently. When I awoke early the next morning, a fine gentle mist had settled over the landscape. After having oatmeal for breakfast, I prepared for the day’s adventure to look for rare plants and animals found only on Oʻahu. 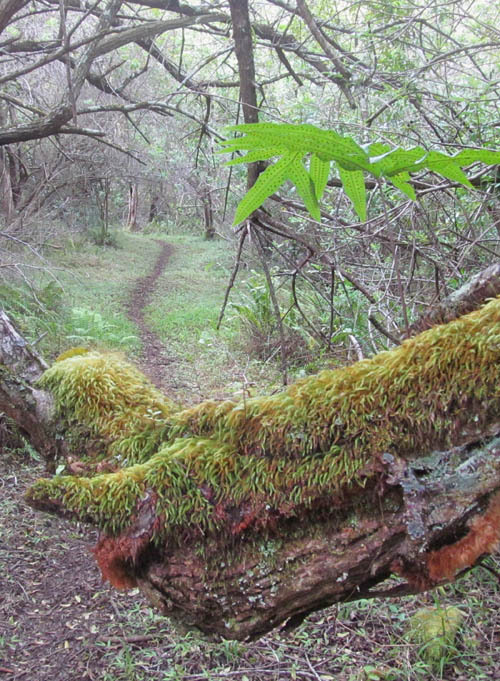 Pahole Natural Area Reserve ranges in elevation from 1,200 to 2,590 feet, and receives an average annual rainfall of about 57 to 66 inches. 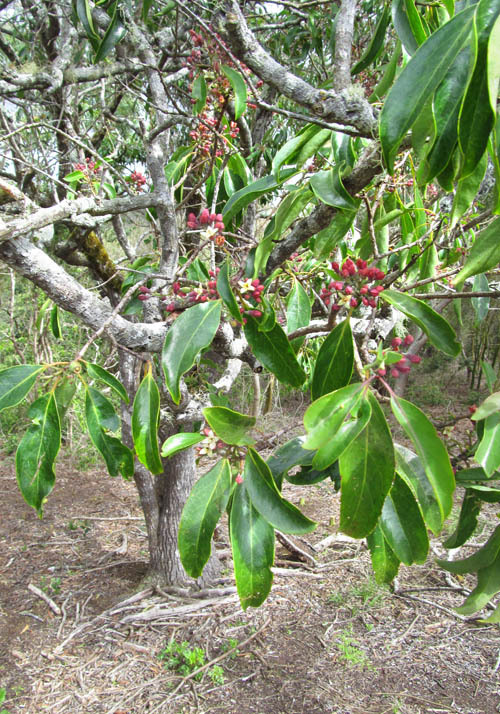 The reserve protects some of the last remaining native mesic and dry forests in the Hawaiian Islands which are becoming increasingly threatened. 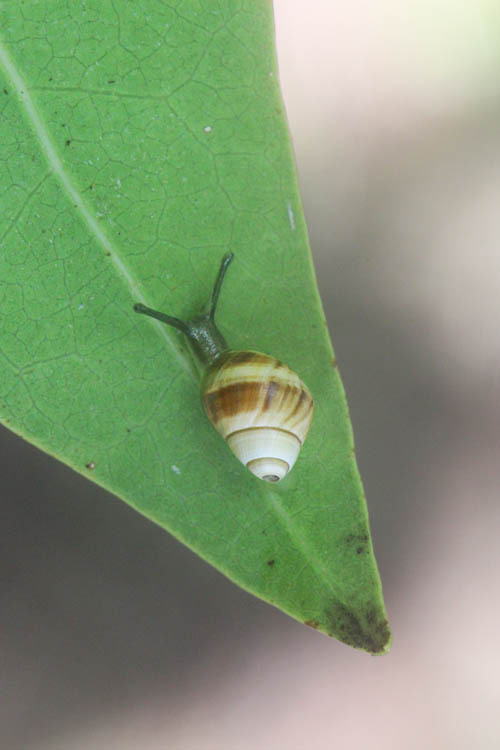 With the vegetation wet from the mist — perfect conditions to see native snails crawling around — I pushed-off from camp shortly after day break and wasted little time making my way to where they live. 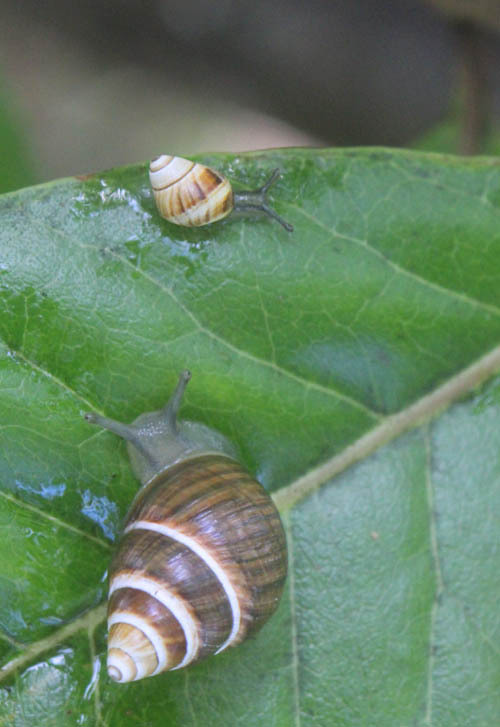 Oʻahu tree snails (Achatinella mustelina) or kāhuli are found only on the island of Oʻahu and are on the federal list of endangered species. The snails are active mostly at night and usually sleep during the day. I scoured the trees in the area for quite some time searching each leaf and branch and saw a number of tree snails in deep slumber. And then I saw it! An adult kāhuli crawling about! 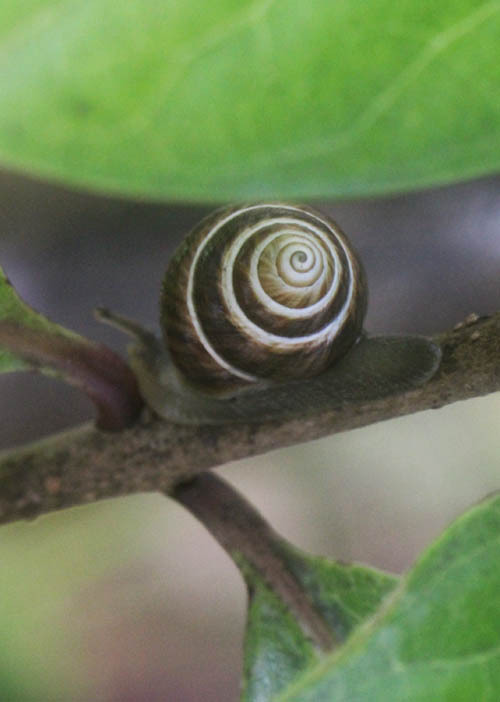 The tree snail was almost three quarters of an inch long and was mostly brown in color with a white stripe that spiraled up to the apex of the shell. When the snail ventured in front of a backlit olopua leaf (Nestigis sanwichensis) and I could barely contain my excitement as I photographed and videoed the sight. When a keiki — baby — suddenly crawled around from the other side of the leaf to its mother, I nearly fell over in excitement! 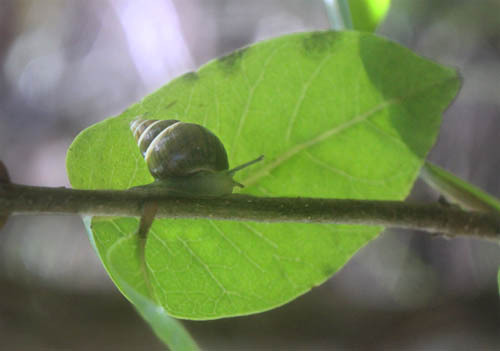 The cute little snail had a shell barely a quarter inch long and crawled along the edge of the leaf. The wind — which had a nasty habit of blowing at the most inopportune time — made photographing the snails difficult and I had to wait between lulls in the wind to capture these shots. Take a look at the video at the end of this write-up to see the kāhuli and keiki crawling about the leaves. I stayed with the snails for almost two hours until they finally retired to the back side of a leaf to sleep for the day. I then left the area to look for rare native plants. One of the more impressive rare native trees I stumbled upon was a large ʻiliahi or sandalwood tree (Santalum freycinetianum) with a trunk well over a foot in diameter. While this species of ʻiliahi is not endangered, I have only seen a handful of specimens reach this size and girth. There were many red buds on the tree which opened a handful at a time into small four-petalled flowers. 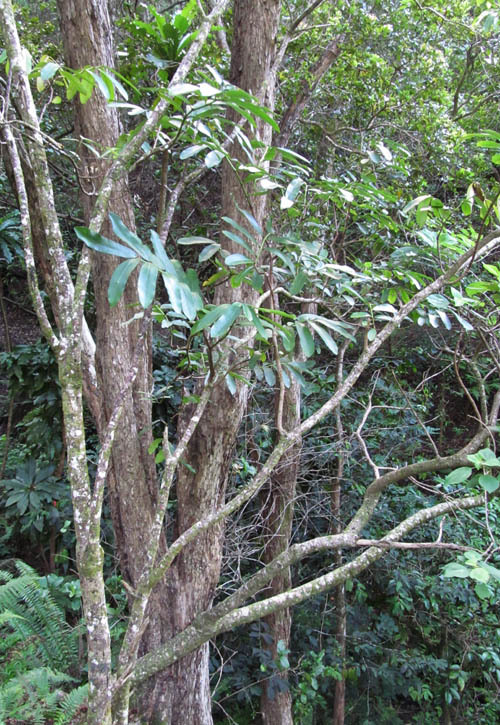 Another rare plant I saw a tree form of ʻakoko — Chamaesyce herbstii — which is endemic only to the island of Oʻahu. 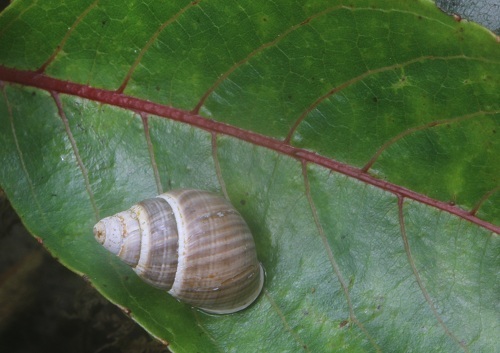 Most other forms of ʻakoko are small — they either crawl prostrate on the ground or into a small shrub. 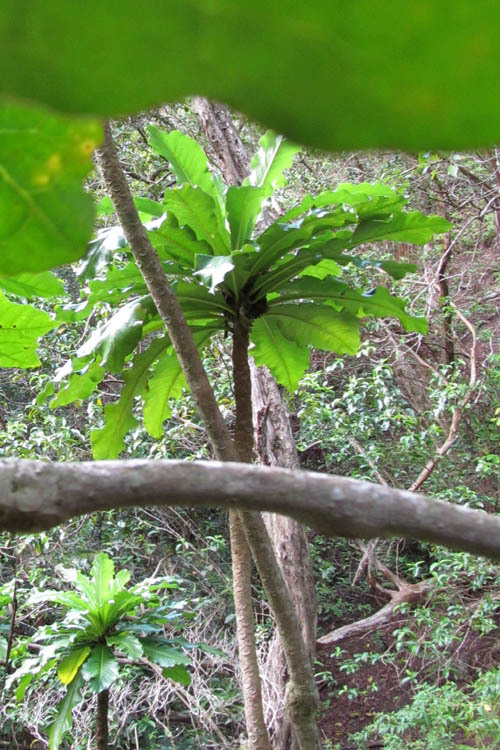 This tree form of ʻakoko is endangered with less than 170 individuals remaining in the wild. Rarer still were ʻoha (Delissea waianaensis), which are in the lobelioid or bellflower family of plants. 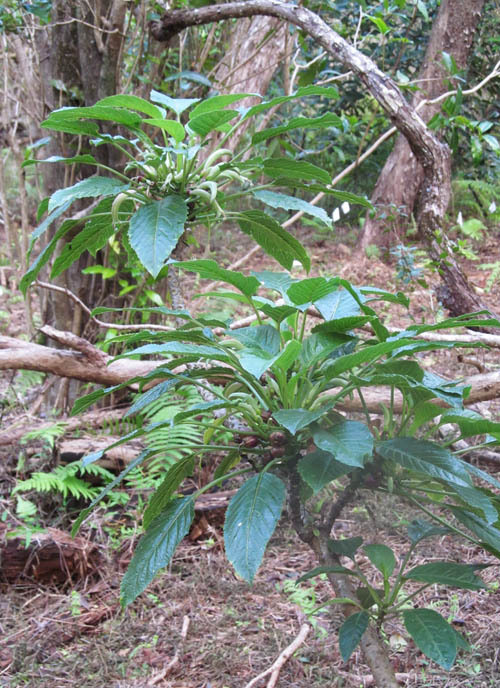 ʻOha are endangered — less than 60-70 of these plants are known to exist in the wild — all of them only on Oʻahu. 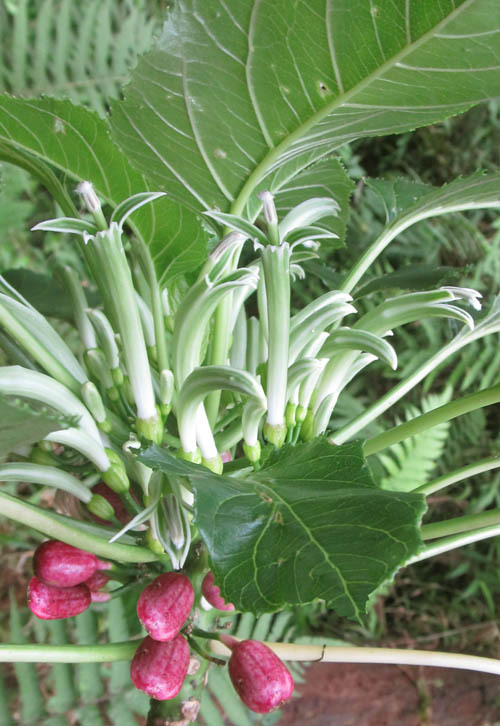 ʻOha flowers are green and white in color and have the same basic shape as other lobelioid flowers. 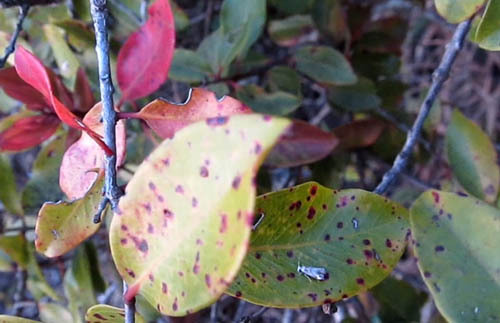 I was pleased to see fruit on the plant whose red color reminded me of mountain apples. I hope the fruit germinate and increase the number of plants. The rarest plant I saw was haha — Cyanea superba — which is extinct in the wild. These specimens were outplanted in an exclosure to protect them from pigs, goats, and other ungulates. The trees grow up to 25 feet high and have long stalks and large leaves up to 2 feet long that make that plant resemble a palm. 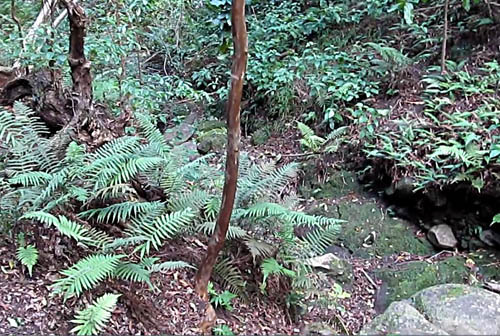 After visiting the rare trees I decided to make my way to stream about a quarter mile away from the hunter’s shelter which is usually our source of water. Just as we suspected — the stream was dry. 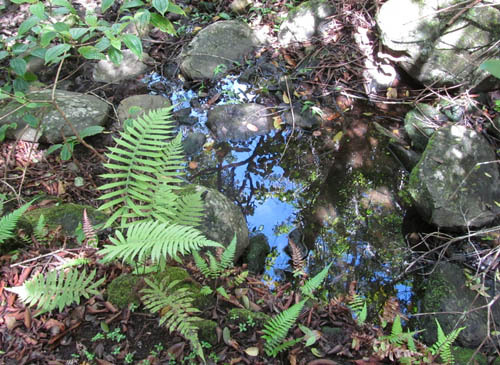 With far less rainfall than usual so far this rainy season, the aquifer had not been sufficiently recharged. Since the stream was dry, I ventured up the dry stream bed to see the springs itself. There was still some water coming out — but very little. I was thankful Larry Lee made alternative plans for us and transported water up to camp — the springs did not have enough water for everyone. While hiking back to camp, I saw one of those circling moths again. I’ve seen this moth a handful of times before in heavily native areas which suggests to me that they might be native. The small moth — less and a quarter inch long — runs in circles over the leaf like its absolutely pupule — crazy! You have to see the video at the end to see the month running frantically in circles. When I got back to the hunter’s shelter, I was greeted by a bunch visitors. 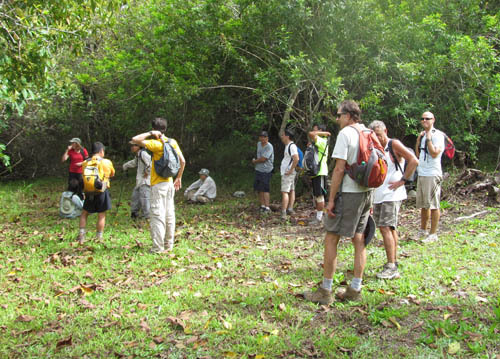 HTMC held its Three Corner’s hike that day and over a dozen hikers were at our camp site. It was good to see Thea Ferentinos and Justin Ohara — who led the hike — and many new faces who were hiking to Three Corner’s for the first time. For dinner I had instant pho (Vietnamese noodle soup) — which I was trying for the first time — it was excellent! I also munched on veggies chips, beef jerky, macadamia nuts, and dried mango. One of more interesting dinner conversations was when August Smith shared how he and Patrick Rorie hiked to “Four Corners”. After hiking to Three Corners they continued on to the summit of Ohikilolo — traversing 4 gnarly notches using the fence as a climbing aid. When darkness descended , the highlight of evening began — Jill Moratto’s Light Show! Jill brought an ipod and speakers, and choreographed a routine to the 60’s classic “These Boots Are Made for Walking” made famous by Nancy Sinatra. We “ooohed” and “ahhhed” as she twirled glow-in-the-dark sticks, hoops, and balls to our sheer amazement and joy! Equally entertaining was Patrick Rorie who sang “Live Like You’re Dying” made famous by Tim McGraw and danced with Jill and the glow sticks. For the rest of night Larry Lee told jokes and coerced each one of us contribute to the entertainment — some less successful than others which made the evening’s entertainment all the more memorable. With the second day of our backpacking trip drawing to an end, my eyelids grew heavy and I retired to my tent for the night. 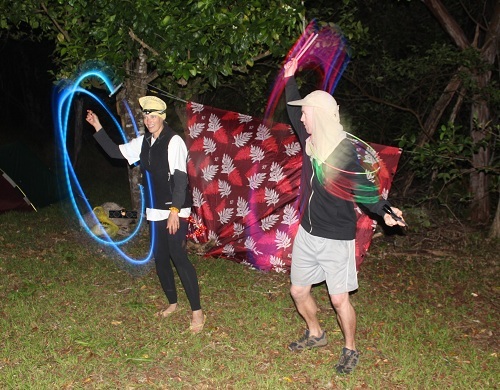 As I drifted off to sleep, I could not help but replay in my mind the great time I had finding rare tree snails crawling on the leaves, seeing endangered plants found only on Oʻahu, and being thoroughly entertained under the stars! What a great day! The little spinny moth is likely Erechthias minuscula. Cool… thanks for identifying it! According to link you provided to Wikipedia the tiny moth is widespread and has been recorded from Africa, Sri Lanka, Java, Australia, the Caroline Islands, Fiji, Samoa, the Marquesas, the West Indies, Hawaii and Florida. Do you know if it’s indigenous? Or is it introduced? Probably introduced, eh? Nate: Thank you for sending this to me. I made me remember a special part of my life experiences I had forgotten. Beautiful pictures and great video, especially with the baby kahuli. I looked at other videos and the search for “Are” was especially heartfelt because I too climbed down the same area. I missed the trailhead for the zigzag descent trail to the airfield and ended up a ridge away towards Haleiwa and scaled down the cliff (4 hours). But that is another story to be told around a campfire at another campout. Be well my friend. Let’s count snails again sometime. Aloha! Yeah, the Hawaii Terrestrial Arthropod Checklist has it listed as adventive, an accidental immigrant. Interesting it’s out in these wild areas, we know of it from our house in Olinda. Thanks for sharing your findings.